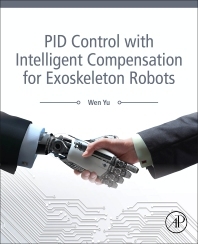 PID Control with Intelligent Compensation for Exoskeleton Robots explains how to use neural PD and PID controls to reduce integration gain, and provides explicit conditions on how to select linear PID gains using proof of semi-global asymptotic stability and local asymptotic stability with a velocity observer. These conditions are applied in both task and joint spaces, with PID controllers compensated by neural networks. This is a great resource on how to combine traditional PD/PID control techniques with intelligent control. Dr. Wen Yu presents several leading-edge methods for designing neural and fuzzy compensators with high-gain velocity observers for PD control using Lyapunov stability. Proportional-integral-derivative (PID) control is widely used in biomedical and industrial robot manipulators. An integrator in a PID controller reduces the bandwidth of the closed-loop system, leads to less-effective transient performance and may even destroy stability. Many robotic manipulators use proportional-derivative (PD) control with gravity and friction compensations, but improved gravity and friction models are needed. The introduction of intelligent control in these systems has dramatically changed the face of biomedical and industrial control engineering. Wen Yu received the B.S. degree from Tsinghua University, Beijing, China in 1990 and the M.S. and Ph.D. degrees, both in Electrical Engineering, from Northeastern University, Shenyang, China, in 1992 and 1995, respectively. Since 1996, he has been with the National Polytechnic Institute (CINVESTAV-IPN), Mexico City, Mexico, where he is currently a professor and department chair of the Automatic Control Department. From 2002 to 2003, he held research positions with the Mexican Institute of Petroleum. He was a Senior Visiting Research Fellow with Queen’s University Belfast, Belfast, U.K., from 2006 to 2007, and a Visiting Associate Professor with the University of California, Santa Cruz, from 2009 to 2010. He gas published more than 100 research papers in reputed journals. His Google Scholar h-index is 33, the citation number is 4100. He serves as associate editors of IEEE Transactions on Cybernetics, Neurocomputing, and Journal of Intelligent and Fuzzy Systems. He is a member of the Mexican Academy of Sciences.